A HUGE thank you to the JADeS for making my 50th a night to remember. Such a great repertoire, fab stage set and they looked and sounded amazing. They created a great party atmosphere, everyone loved them and I would certainly recommend them to anyone looking for a class act for their event. Well done girls. The JADeS performed at our garden party in July to help raise money for The Bridge Dementia Advisory Centre. They performed two sets for us and really got the crowd going. I can’t recommend them enough. The music they do covers all ages and genres. Everyone had such a great time. They are truly amazing, thank you all once again for helping make the day such a great success. Had a fantastic night at the Pantry watching these fab ladies. Highly recommended. I just wanted to Thank You for your amazing performance when you played at the Jacksons Wharf, as part of our Big Band Charity Evening, the full event was a massive success and we raised a lot of money for 2 very worthy courses, I would just like to say your session was brilliant and I had lots of rave reviews on your performance, I would love to have you back at the Jacksons Wharf in the near future (Christmas rings a bell). Just listening to the girls at The Pantry Diner, York Road, Hartlepool. Nice local talent who have fab voices and getting the groove on. These girls a fabulous!! They really know how to get you dancing!! Awesome 4 piece band that rocked our night! A fantastic group suitable for any occasion. I attended a function last year and the The jADeS ladies were amazing. They were booked as a warm up act for the drinks reception before the black tie dinner. They were easy listening and really started the evening with class and elegance. They were so good that they have been booked as the main entertainment at this years event, I am looking forward to dancing to night away to their songs. 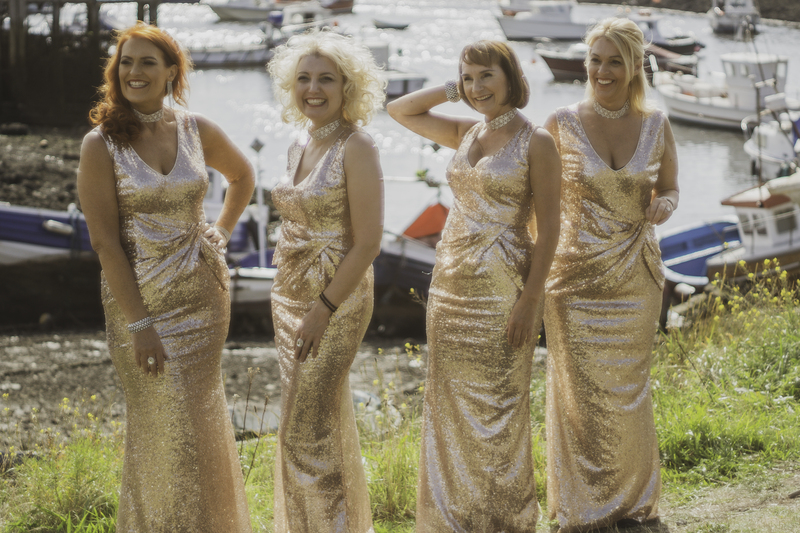 The perfect day was enhanced with the fabulous girl group The jADeS they even found out our wedding song and put it into their repotoir with only a couple of weeks notice All the girls are TOP CLASS!! Made our first dance and wedding day THE BEST! The Jades are absolutely amazing! We first heard them sing at a vintage festival in York earlier in the year and after hearing just one song we asked if they were free to do our wedding. Their harmonies were exceptional and they were so friendly when we spoke to them and interested in hearing about our big day. After arranging all the details, they were keen to make sure to pick up on all the little details and let us pick out favourite songs and even our first dance song (‘At Last’ by Etta James) so that the set was personal for us. On the day they were even better than we remembered and we really enjoyed hearing some new songs. All our guests loved them as they were not only singing the songs but really interacting with all of our guests and ensuring that everyone had a great night! I would recommend The Jades to anyone who wants to give their wedding that something special – you’ll even get a lovely email on your wedding anniversary from them! Fantastic Band – 5 Stars!! I attended the annual BNI awards dinner in 2016 and weren’t disappointed. Their range of songs was excellent and made for a wonderful atmosphere. Can’t wait to see them in action again! The Jades sang out our wedding. We had a biggish gap during a day and we booked the Jades. They were brilliant and fun, getting the guests dancing and generally helped make our day special and fun for our guests. Andy Larmouth – Magician Thanks for entertaining! Sounded great! Everyone in the club had a brilliant night and are still singing your praises. You were a credit to yourselves and everyone is so looking forward to you coming back for our Xmas party and giving us another great nights entertainment. Without question, you guys are absolutely fantastic. These women are absolutely fantastic..and so talented. They are guaranteed to get you up dancing. We have had them perform in our cafe.. Cafe Rappor Bar, hartlepool marina, twice now and each time they have been amazing. (Were having them back in june)! I would recommend them to anyone!! We were hosting a black tie charity ball which had an audience from young twenty somethings to, shall we say more mature guests! Finding entertainment to keep all entertained is a challenge as I have seen people walking out of these events with fingers in their ears making some sort of elderley protest, or younger people giggling at the efforts of some overweight faded lothario crooning Robbie Williams esque. The Jades were absolutely spot on for this brief. Stylish, Glamorous and a set which litrally had something for everyone, evidenced by the full dance floor from start to finish. Thank you ladies you were superb. Phil Walsh These girls are amazing singers. These are a must for all kinds of functions . The best news is they are all really nice ladies as well which it very rare to find all qualities all rolled in to one . Try to catch The JaDeS whenever they play locally. Fab foursome! Lovely voices and a set list containing something for everyone. Always a great night. Recommend to everyone….go see ’em you won’t be disappointed! We booked the JADeS for our wedding reception and WOW they were great. Right from the first enquiry messages to booking emails to meeting before the big day, I was impressed with the friendliness and professionalism of this group. On our wedding day they were just amazing. All of our guests were impressed and had only good things to say. Thank you for getting our party started in amazing style. I would recommend the JADeS for weddings and other events. Thank you, lovely ladies!!!! And thank you for the card and CD you left for us. Perfect touch! Patricia Muers Reay Great night. Just been talking to my neighbour Olwen Gibb whose daughter Joanne’s wedding you sang at last week. She couldn’t sing your praises highly enough and said on the back of that the venue booked you for Christmas. We’ll be seeing you on Britain’s got talent next! Just thought I would let you know. The Jades. A fabulous girl group. The girls are a lovely friendly group. Nothing is too much trouble for them. They even learnt 2 new songs which we wanted them to sing for our wedding. They made our day complete everyone loved them. They got the party going. We would highly recommend them. Saw the JADeS last night for the first time.. absolutely loved them. I met these amazing ladies at a charity event that I held 2 years ago. They came to my aid when I was let down by a act that I booked. Their voices are amazing. Since then we have followed them avidly as well as my 11yr old been one of their most followers. We adore these ladies and would highly recommend them to any event. The Jades look and sound amazing and performed an impressive range of songs. They created a great party atmosphere and helped make my celebration a night to remember. Stephen Picton Pop stars on my friends list. Elaine Pruett You are all amazing !!!!! Anna McCarthy Brilliant. I loved this. Hartlepool – Positive People in a Positive Town Fantastic ladies !!!! Kenneth Dawson Could be in the top 10 shortly. Claire Hickling So good! I remember you humming to yourself down in the office! Thomas John Tighe Fantastic sound Ladies, well done and good luck for the future. Andrew Kilgour Fabulous that’s cheered me up. Hall Garth Hotel, Golf and Country Club. 25 March Darlington. Angela Mason Fabulous day and an outstanding performance from you all ladies! Kyle’s Dreams open day event. 16th June 2018. Simon Carter Looking fantastic ladies ! The Duke of Cleveland party night 6th June 2018. Lesley Watson I really like that girls., really. It’s so good.